I promised you I would bring delicious recipes back from my trip to New York. So this is the first one I will share with you. Blueberry pancakes - they're really fluffy and I am happy about the result. The blueberries give these little bad boys a fruity note. Combined with the fluffy pancakes you might think you are eating a fruity cloud. Sounds crazy - but according to me this is an accurate comparison ;-). I have to admit that I only ate real American pancakes twice in my life; the first time during my trip to New York in 2013. I was not that convinced about these huge dry discs (as I used to call them). Talking to some of my friends they explained to me that what I had there were not the best version of their favorite breakfast. Alright I thought - next time I will give them a second chance. This year, when I went back to New York, I had to be true to my words. Those following my on Instagram saw that my breakfast treat at Extra Virgin was just perfect. 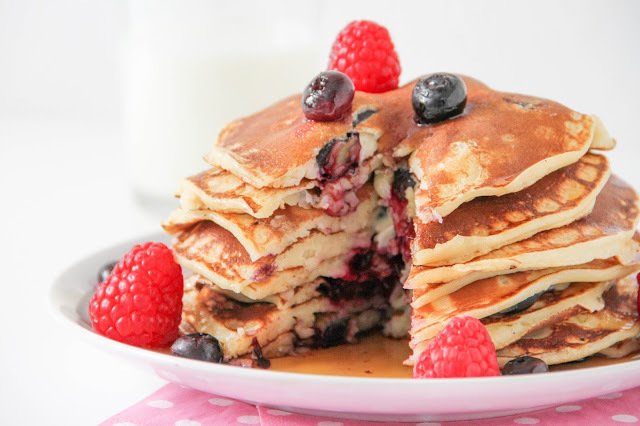 Fluffy pancakes with loads of berries and a little maple syrup to round it all up. I left all prejudice aside and am now an official fan of pancakes. Pancakes are part of the list of foods that I saw on TV years before I first tried them. Back in the days, when someone talked about pancakes I always thought about sitcoms or movies I used to be watching during my teenage years. 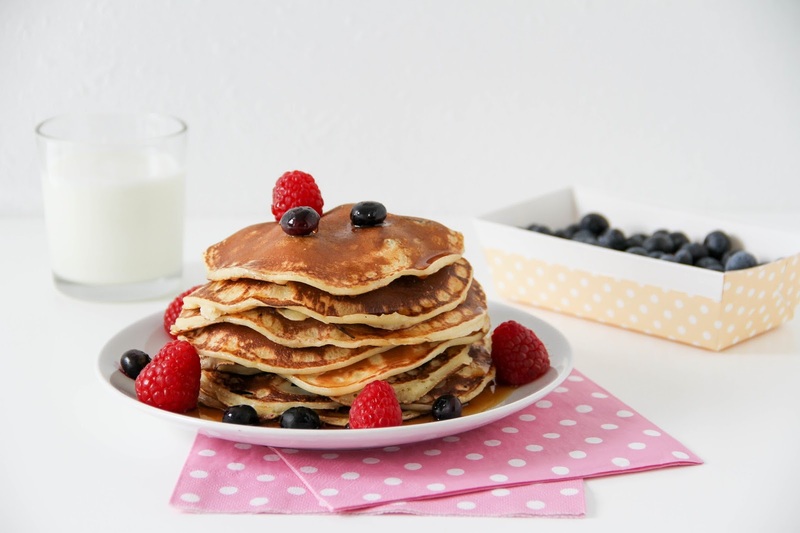 Children would always get pancakes or waffles for breakfast. Back here in Europe, breakfast rarely includes pancakes, and when it does, they're not the fluffy kind of pancakes but rather Belgian crêpes. The only had real pancakes twice in my life. As mentioned about, since my last trip I really like them but I couldn't eat pancakes every morning. 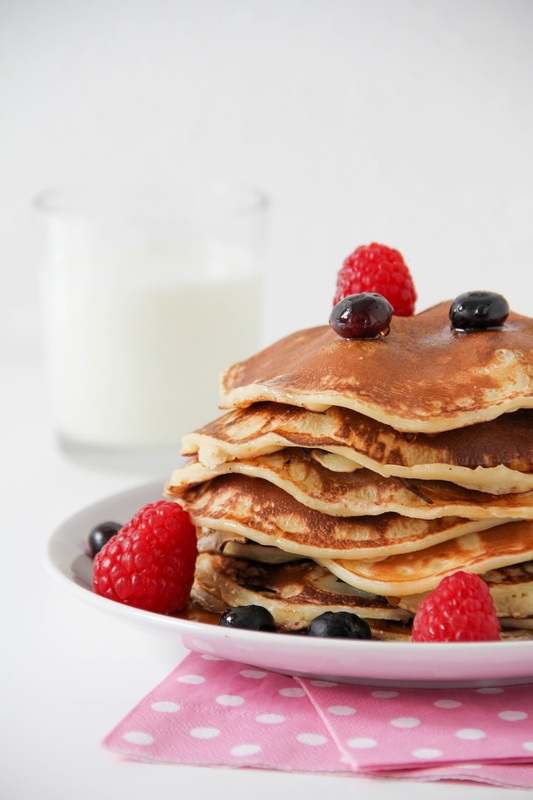 Already that I have to force myself to have breakfast, I would be a little bit too lazy to prepare a stack of them at 7 am. blueberries, raspberries and maple syrup to serve. Il a bowl whisk the eggs on high speed. Add the milk and buttermilk as well as the melted butter. In another bowl whisk together the flour, baking powder and sugar. Add the egg mixture to the dry ingredients and mix until you get an even dough. Slowly add the blueberries and mix. Melt a knob of butter in a frying pan. Add 3/4 of a soupspoon into the pan. 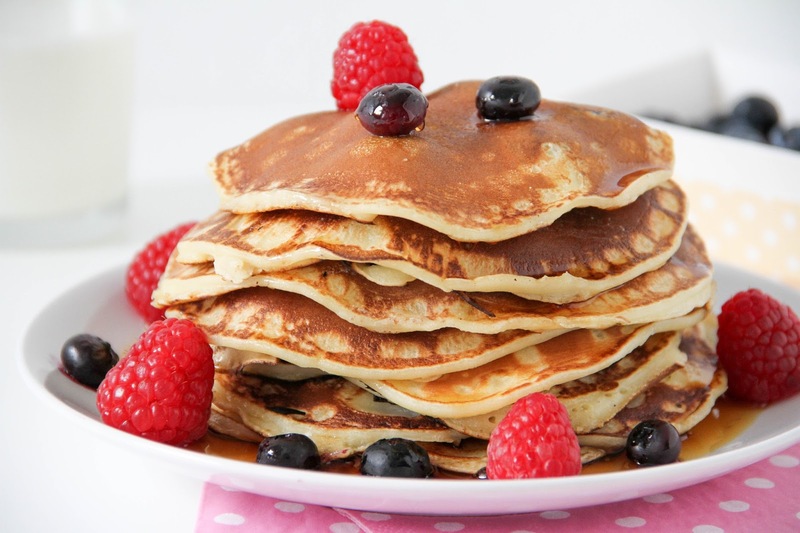 Cook the pancakes over medium heat until the first bubbles appear on the surface. Now they're ready to be turned. Wait another 60 seconds until you take them out of the pan. 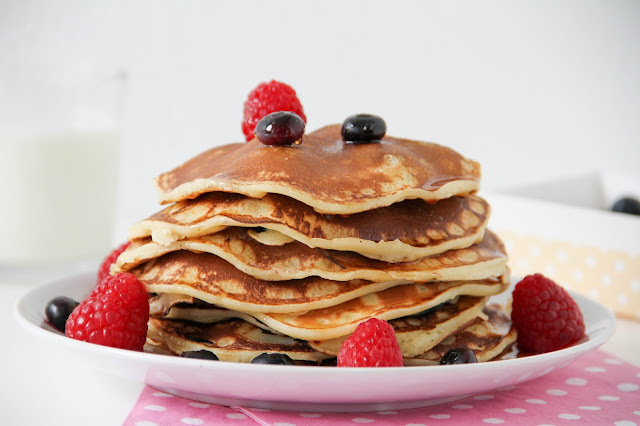 Stack the pancakes on a plate one after another. When all the pancakes are ready, top them with blue- and raspberries and pour some maple syrup over it all.